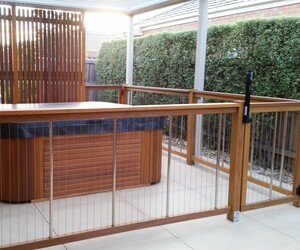 Sentrel manufactures vertically tensioned cable balustrade and pool fencing in both classic timber and maintenance-free aluminium styles. The design incorporates marine-grade vertical cables and a contemporary aluminium system that can be ordered without a handrail, or a choice of handrail options — matching aluminium or timber. The system is fully compliant with Australian Standards. By combining the stair and deck balustrade with gate and pool fencing options, Sentrel delivers a seamless, coordinated and contemporary poolside look. While the appearance is light, simple and stylish, the structure is strong and durable. Pre-made panels facilitate fast and easy installation and the clean contemporary lines ensure that the view is uninterrupted. 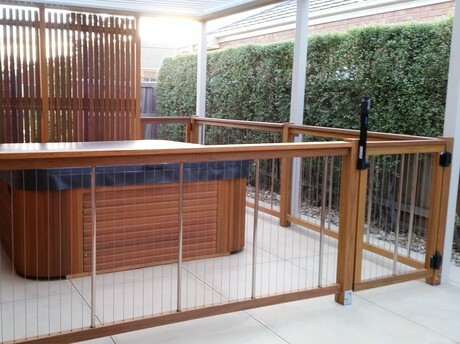 Sentrel balustrade and pool fencing complements timber, steel or concrete rendering, adding warmth to any design. 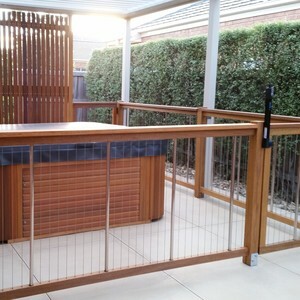 I am interested in Sentrel pool fencing .